This exhibition at the Schmidt Center gallery, Florida Atlantic University, presented four works, “Public Secrets”, “Blood Sugar”, “Inside the Distance” and “Undoing Time”. “Public Secrets” provides an interactive interface to an audio archive of hundreds of statements made by incarcerated women. “Blood Sugar” examines the social and political construction of poverty and addiction in American society through the eyes of those who live it through an interactive interface to an audio archive of conversations with 20 current and former injection drug users. “Inside the Distance” documents victim and offender mediation practices in Belgium, showing how mediation poses a potential cultural alternative to dominant modes, methods and theories of justice and punishment. Undoing Time is a series of multi-media installations and online archives, co-authored with incarcerated men and women. 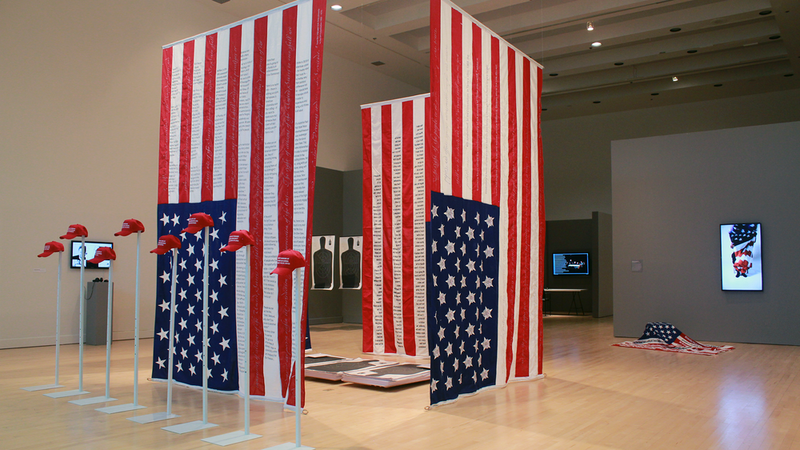 In “Undoing Time”, flags, targets, and uniforms made for state institutions by prisoners in California’s prison factories are ‘inscribed’ (embroidered, printed, laser-cut) with the testimony of incarcerated men and women. The products thus transformed materialize a gesture of resistance to the injustices of the criminal legal system and mass incarceration. A longer, two-channel version of this video, displayed at the front/right of the gallery. Online, this video serves as an introduction to all of the Undoing Time | ARCHIVE. 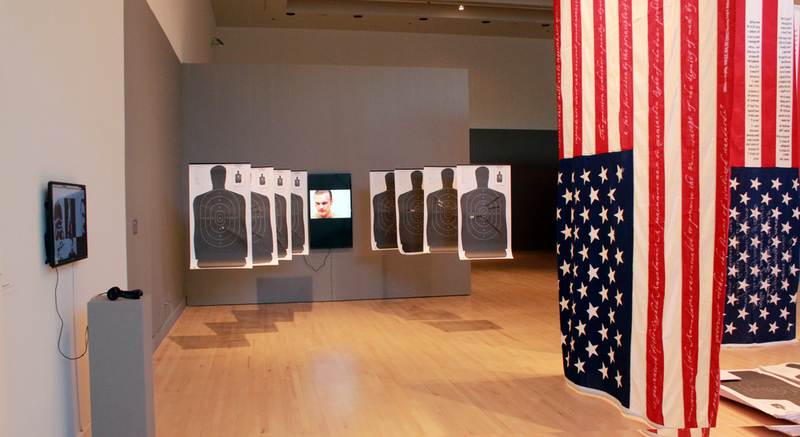 The altered flags, targets and clothing produced by incarcerated men and women in California prisons are, in this context, intended to stand for the absent bodies, the temporalities, and the experiences of those whose lives are taken from them, and us, by mass incarceration and the criminal justice system. CONVICTIONS was the title of an exhibition mounted by STUK Kunstcentrum that brought together four of Sharon Daniel’s recent works: Public Secrets, Blood Sugar, Inside the Distance and Undoing Time. In his essay for the accompanying Cahier author Pieter Van Bogaert wrote, “[Convictions] is a misleading, ambiguous title, which can be interpreted in at least two different ways. It can be read as the verdicts of guilt handed down to those who are accused, or as beliefs in a given system. These meanings are interchangeable, and that is what this exhibition invites us to do: to change locations, put yourself into other characters, spaces and situations. It means setting yourself aside, as well as bringing yourself to the fore, stepping back and approaching. Each change of place creates a different meaning. Each meaning creates its own truth." UNDOING TIME | PLEDGE UNDOING TIME | SOS and UNDOING TIME | online interface were official selections in Alternate Realities, at Sheffield Doc|Fest 2016.